It doesn’t get any better than this! This venue is massive! 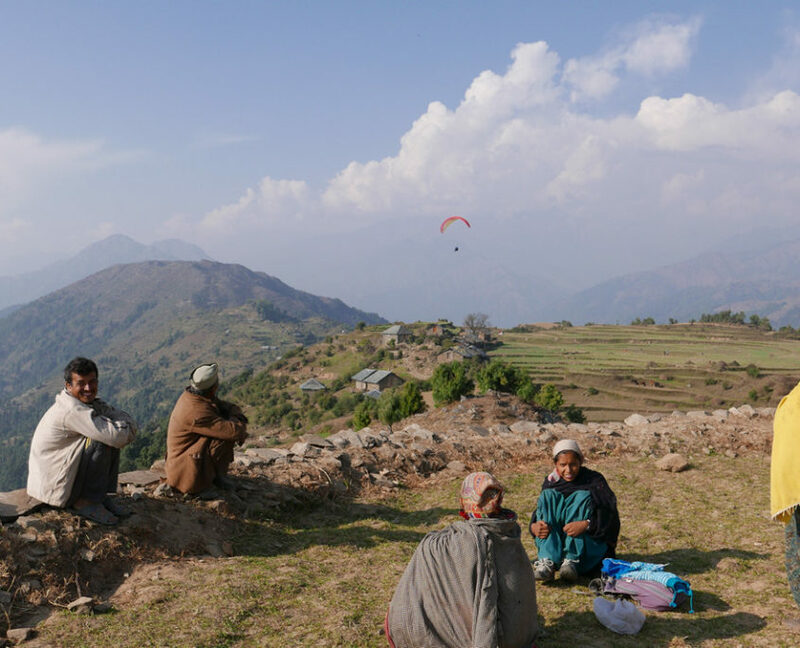 The Indian Himalayas around Bir are without doubt one of the easiest places on the planet to score big XC flights. After flying the Indian Himalayas nowhere will ever again seem as big, as colourful, or as exotic. You’ve been warned! Big distance mountain flying has never been easier. If you’re after 100km (or more) you can expect it here. 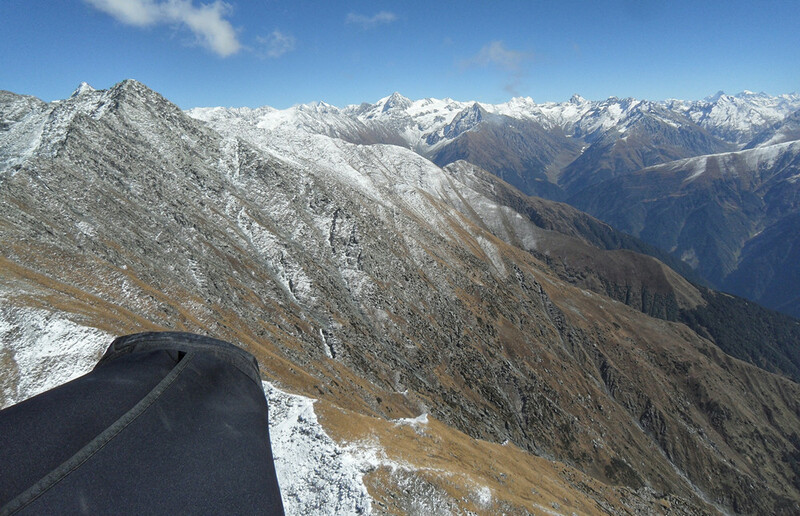 In fact you can expect it day after day: day after day of big thermals, long glides, and outrageous mountain scenery. You’ll be staying in the centre of a centre of a Tibetan colony, surrounded by chanting monks, rice paddies and tea fields. You’ll also have the opportunity to camp-out under the stars on the mountain. This is a trip to remember. Very reliable. You can fully expect EVERYDAY to be flyable out here. Fly fly fly! This trip is open to autonomous pilots qualified to at least CP level. Pilots should also have some previous XC experience. Conditions on launch are often light so pilots should be reasonably proficient with light wind launch techniques. This venue is massive. It’s without doubt one of the easiest places on the planet to score big XC mountain flights. If you’re after 100km (or more) you can expect it here – day after day. The main launch point is at approximately 2400 metres (almost 8000’) located in the meadow on the top of a ridge at Billing – a ten kilometre drive from the valley floor and our hotel. The landing area is in the fields at the western edge of the Tibetan Colony. It’s big, grassy and beautiful. The Himalayan mountain range here is called the “Dhauladar” Mountain range, one of the most dramatic mountain ranges anywhere. 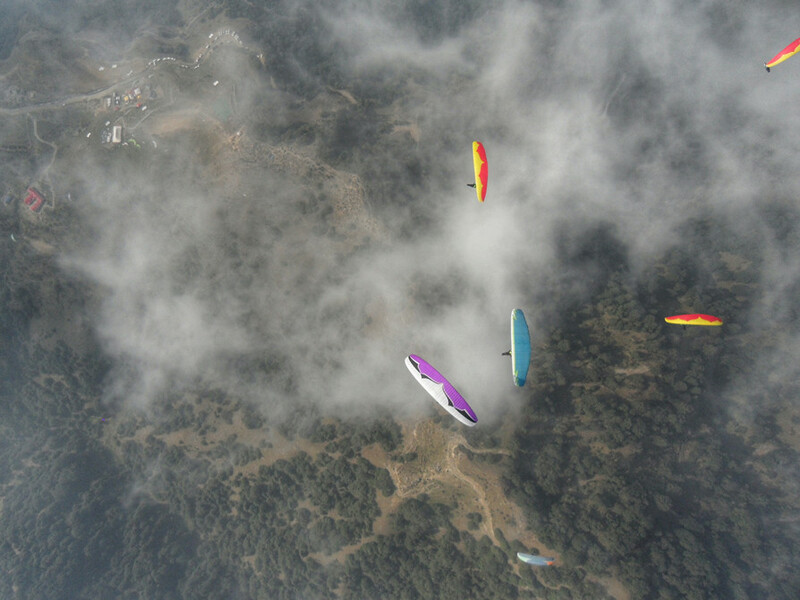 Most of the flying happens on the southern faces of this range high above the wide open Kangra valley. This venue lends itself particularly to big out and return flights. Temperatures in the valley during the daytime are rarely hot, but usually comfortably warm “T-shirt” weather in the middle of the day. Up in the mountains is a different story! It’s not unusual to be flying at 4000m or more. Up here it can be very cold. We recommend that pilots fly with good quality winter flying kit (eg winter gloves, thermal underwear, down jacket etc). The thermals in the Bir flying arena are not particularly strong and usually gentler than the Alps for example. The thermals are more often than not marked by HGVs (Himalayan Griffon Vultures) and very easy to find. The winds are also generally quite light and dominated by the southerly anabatic flow during the day. As is common elsewhere, winds tend to have a slight easterly bias earlier in the day and more of a westerly tendency later. No matter what your level we are there to help. One guide is always last to launch so always there to assist. We will be flying with you – most probably splitting into smaller groups so you can get the most out of the experience. This will mean less experienced pilots can expect to get feedback on their thermalling skills whilst more ambitious and experienced pilots will not be hindered from covering bigger distances or more challenging flights. Each trip will have two mid-week adventures. For example, a night out on the mountain with all food, tents and camping organised for you. 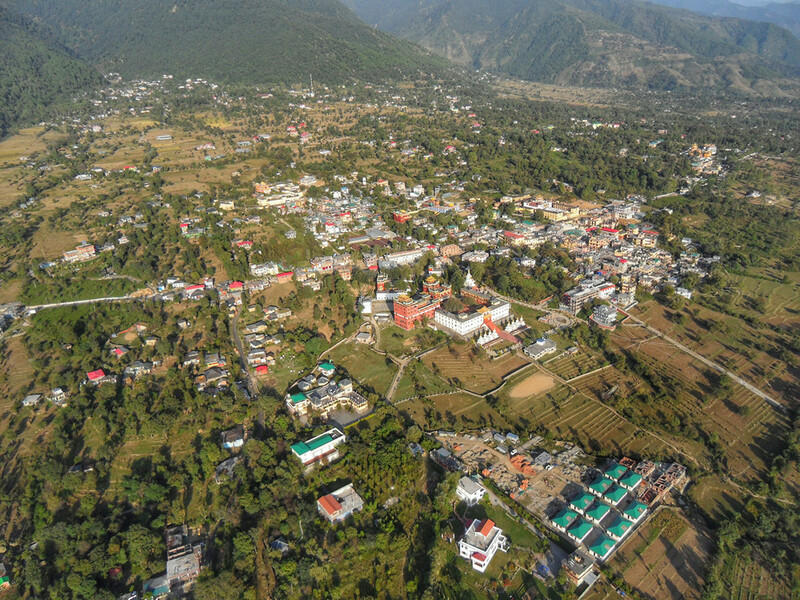 Another possible adventure: flight to Dharamsala (near the Dalai Lama’s residence) with a night out in a local hotel – returning to Bir the following day. Bir is a very charming little town situated in the foothills of the Indian Himalayas. 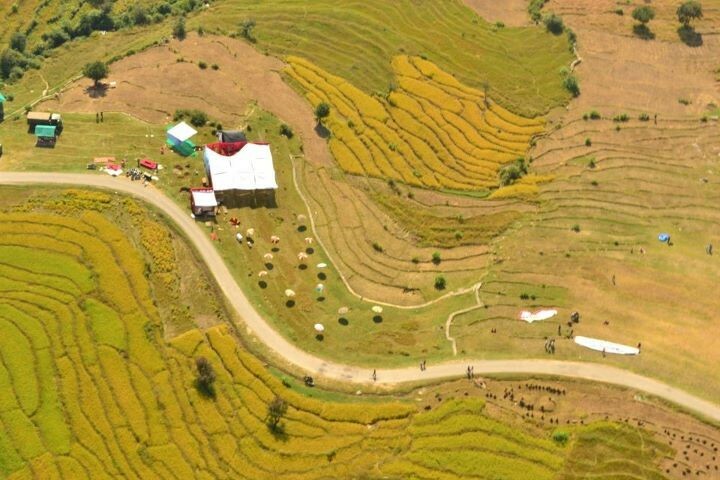 Set amidst winding paths, tea gardens and the forests of the Himalayan foothills, Bir makes for the perfect paragliding base. The greater Bir area is home to a thousand Indian villagers and also a vibrant Tibetan Colony which was established in the early 1960s following the exile of the Dalai Lama and other Tibetans from Tibet. 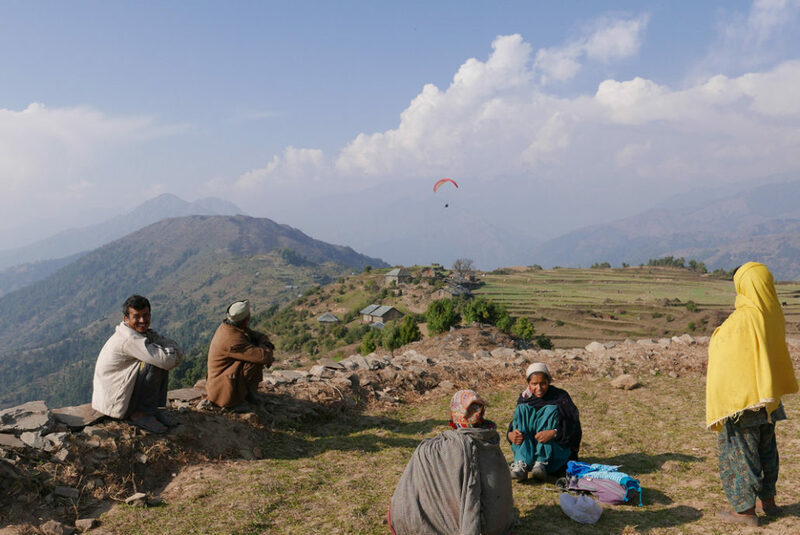 It attracts a few tourists throughout the year and is now well set up to accommodate seasonal waves of paraglider pilots. With small cafes and restaurants scattered between the landing field and our accommodation it’s also perfect for sampling both Indian and Tibetan cuisine. The food here is delicious! 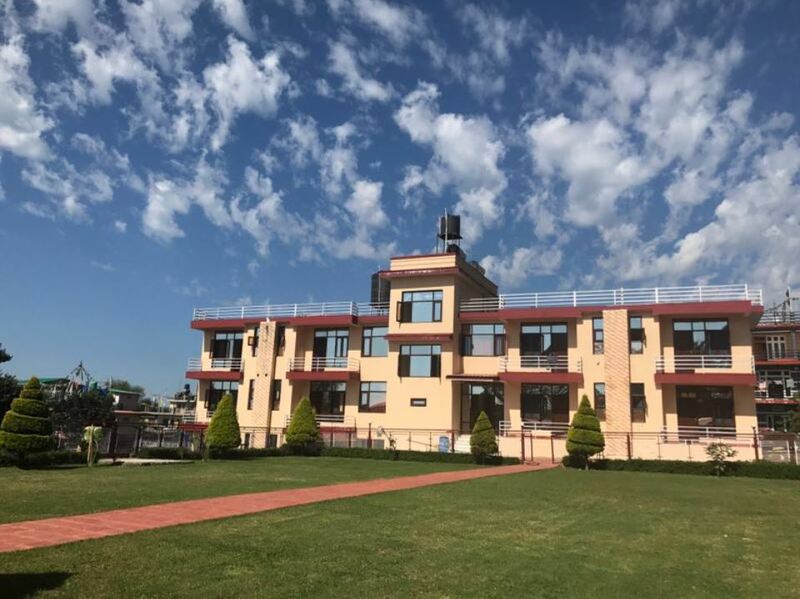 We’ll be staying bang in the middle of the Tibetan colony at the Nyingma Peace Hotel, set aside from the bustle of the main street and with its own grounds and run by the local monks it’s a little haven of peace (and has the best coffee and cake in town). You have your own room – a single room included in the price of this trip. If you’d prefer to share please get in touch. Eat breakfast on the lawn. Explore the plentiful restaurant options all within easy walking distance of the hotel for dinner. Lunchtime normally overlaps with the best part of the flying day. Some pilots opt to go flying with snacks, others grab a late lunch in the afternoon after they land. Mobile telephone. Please bring an “open” phone (preferably smart phone) as we will be providing you with an Indian SIM card. Sleeping bag – The accommodation we use is quite basic, but you’ll really only need a sleeping bag for our night out on the mountain. A medium toggle bag will be more than adequate. Even on our “night out” blankets are available. Sunscreen and sunglasses – It will sunny during the day! Summer clothing – It can be shorts and T-shirt weather in the middle of the day. Warm clothing – not only for flying but for the evenings too. It can get quite chilly in the evenings particularly if we stay high. Camera – This is the Himalayas! Great photos are assured! Reading material, good conversation etc, – You might find you have quite a lot of free time in mornings and/or evenings. Whilst we tend to leave the hotel at about 8:30am most mornings, we could be home as early as 3 or 4pm. Satellite tracker – we recommend the Garmin Inreach satellite devices. These have much better coverage in the Himalayas than the Spots, and although the Spots seem to have sufficient coverage, the Garmin Inreach devices have other advantages over the Spots. Please get in touch if you’d like a purchase a Garmin Inreach. Please book flights to arrive in Dharamsala airport (also known as Kangra airport or Kangra-Dharamsala airport or even Gaggal airport) on the first day of your safari and depart on the final day to qualify for free airport transfers. 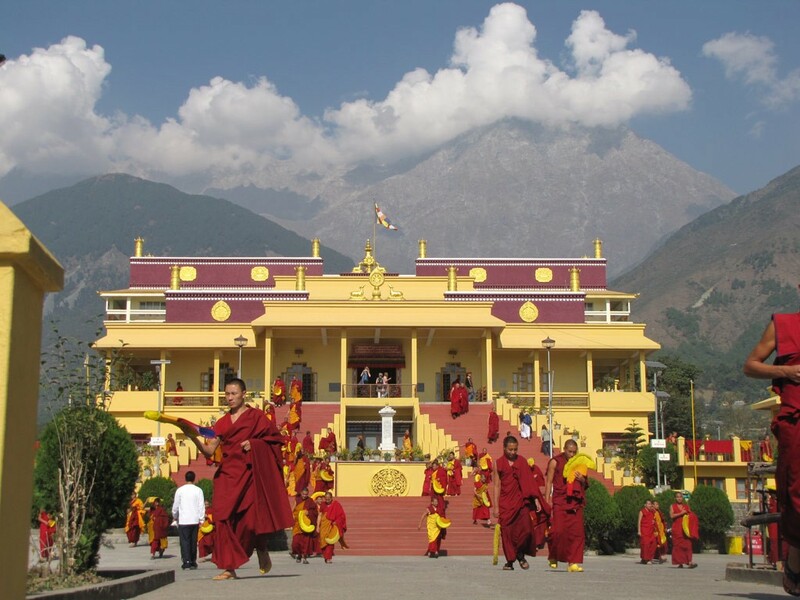 Dharamsala is best reached by a short domestic flight from Delhi International airport. This route is served by both SpiceJet and AirIndia and the flight takes just over an hour. For example, if your trip is Monday to Monday then your flights should arrive and leave on those days. Your flights can arrive and leave at any time to qualify for free airport transfer. Some pilots have also found that flights to Amritsar are more convenient or more economic than New Delhi. Other pilots choose to spend extra time in India at either end of the trip. Transfers are all included. We’ll meet you at the airport at the beginning of your trip and drop you back there at the end. If you are planning to stay in India for no more than 60 days, the easiest visa to apply for is the e-visa. You’ll need to apply for this at least 4 days prior to arrival and no more than 30 days before arrival. Full details can be found here: https://indianvisaonline.gov.in/visa/tvoa.html We recommend you reserve a couple of hours for this process and pay particular attention to photo requirments. Your routine vaccinations should be up-to-date. These usually include diphtheria, tetanus and polio. Travel clinics will also usually recommend Hepatitis A and Typhoid. The Indian state of Himachal Pradesh is certainly one of the less risky areas of India in terms of disease, but we absolutely recommend you consult your Doctor or recognised travel clinic well in advance of your trip. There are about 85 rupees to the £1. Best cash exchange rates can be found from local money changers in Bir. There is also an occasional ATM available in nearby villages. We require you to have insurance that covers repatriation. Please make sure that your insurance is valid for India and of course that paragliding is covered! Please bring insurance documents with you. You will not be allowed to fly without proof of insurance!! You must bring all you flying documents with you, including your flying licence and your paragliding insurance documents. We will be on hand to help you apply for flying permits on arrival in Bir. We will help arrange all the necessary photos and photocopies on site. 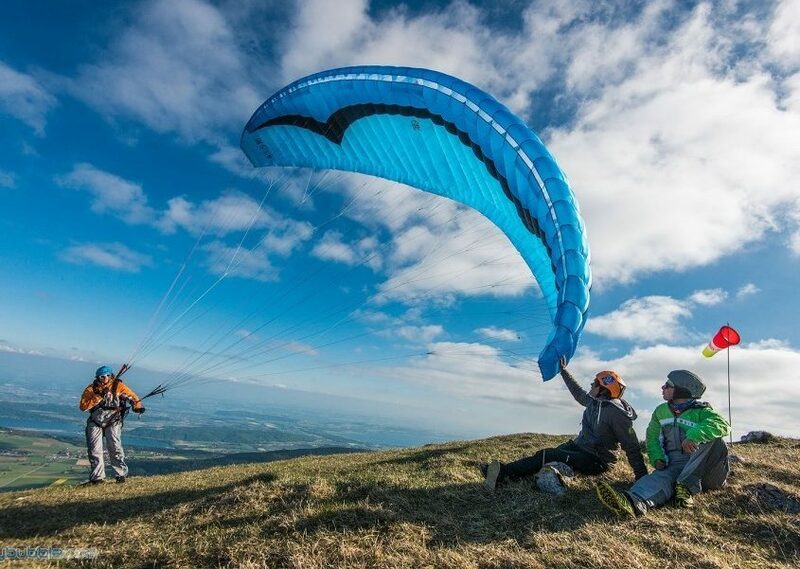 The cost of these is covered by Passion Paragliding and included in the cost of your trip. If ever it’s not flyable here, there’s plenty to do, from trekking to exploring by hired scooter etc. etc. We’ll be there to help where we can. There’s a very high chance of it being flyable every day. After 6 days of flying we will be taking a rest day – for the benefit of you and us. Continuous flying can take its toll. Most pilots will welcome a break from the flying. Flying “fresh” is important for safety. As with all our trips, we’ll be using live-trackers for your safety. These are included in the cost of the trip. They also help with post-flight analysis. Shortly before your trip we’ll send you an updated set of waypoints and on arrival you’ll receive a flying map. Full guiding service with top guides. There is at least one top guide per 5 clients.